The University, its real estate, and a vision for Hyde Park retail. But to many in the Hyde Park business community, the sound of slamming doors resounded as the song of new opportunity. Situated on the corner of 53rd Street and Kimbark Avenue, the University-owned storefront property sits just off the wellspring of the Harper Court development, which brought in a movie theater, an Akira clothing store, and a Hyatt Hotel, currently under construction. 1301 East 53rd Street was an attractive prospect, a fact certainly known to both small businesses looking to expand and the owner of the space, the University of Chicago. Ahead of the curve in vying for this property was Robust Coffee Lounge owner Jacob Sapstein. Sapstein, who had been looking to expand his small business from its 63rd Street location for some time, was seeking to further integrate with his target customer—the campus community. Sapstein toured the space on June 1—the day before Third World’s official closing—and just days after the close he requested a letter of intent form from the University. “We got in touch with the University of Chicago’s realtor. We saw the space and they seemed very eager to get us in and get us information. We looked at it and it worked perfectly for what we wanted,” Sapstein recalled. In under one week, Sapstein completed all the procedures that the University’s hired representative for this particular property, Brenton Shve been for years—and a business proposal, agreeing to the University’s rental rate ($30 per square foot; $3,372.50 per month on a modified gross basis). A showing, a proposal, and several e-mail exchanges later, it seemed as if Robust had a shot at a great new space, right on the edge of the Harper Court redevelopment taking place down 53rd Street. “Let me know if you are ready to move forward with a proposal after the walk through today. I already have a draft proposal ready for the University to review before issuing,” Schrader told Sapstein in an e-mail on June 7, less than a week after Third World Café closed its doors. By June 11, Sapstein was eager to fill out a form expressing his intent to go through with the lease. Sorry to go quiet. I have had a ton of showings for the space. The University wants us to keep marketing it and allowing time for new showings before narrowing the field and zeroing in on a tenant. There has just been a lot of activity, but I will be in touch soon with an update. I appreciate the follow-up. According to Sapstein, the talks stalled after that. Further inquiries were met by the same response: that the University was getting a lot of interest for the space. When asked for comment, Schrader explained he was no longer working on that project and recommended an employee in the University’s real estate office. This employee in turn declined to comment, deferring to a spokesperson for the Office of Civic Engagement, Calmetta Coleman. To the memory of many community members, the resurgence of the University’s commercial realtor persona can be pinned to a single series of phone calls in February 2007. Working with the South East Chicago Commission, the University conducted a phone survey with residents of Hyde Park and Kenwood to gauge their views on the nascent 53rd Street project. Public opinion was on the side of development: 76 percent of respondents wanted more retail. The University’s Commercial Real Estate Operations, which spearheads property acquisitions and lease negotiations, wasted no time. At the steering of CREO, big-ticket commercial bodies such as Akira, Harper Court Theatre, and Clarke’s descended on 53rd Street within five years. The vision? To make 53rd Street a real “destination,” in the words of CREO’s associate vice president, James Hennessy. But even as these initiatives charge ahead, the nuts and bolts of CREO’s operations remain little known in the community. CREO discloses very little public documentation of both its individual transactions and its collected data. Unlike some peer universities, the U of C does not discuss the terms of its leases, nor does it release a complete list of its commercial properties or those of its holding company, Lake Park Associates. In contrast, Brown University publicly provides a map of all Brown University-owned property, including its commercial properties. Harvard University also provides a list of its commercial properties. The resulting picture is unclear, as to what the University envisions for business in Hyde Park, and how it plans to achieve it. 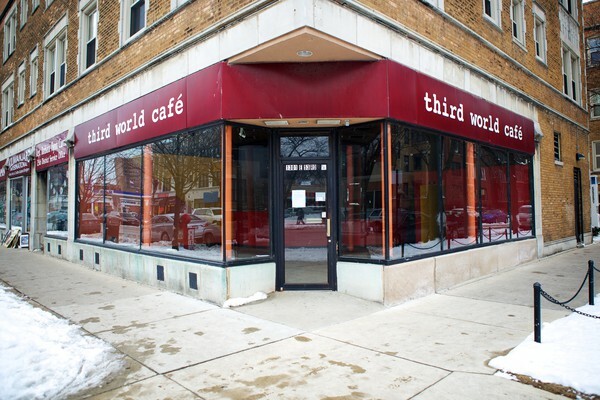 Third World Café, at East 53rd Street and South Kimbark Avenue, closed last June. In October 2012, chef Matthias Merges, owner of the Japanese restaurant Yusho in Logan Square, announced he would open a second location in Hyde Park. It would be in the space formerly occupied by Third World Café. According to University officials, talks with Merges about the space had begun before Third World closed. “To my understanding, by the time we began to get interest from other folks, we had already made an agreement with Matthias Merges,” Coleman said. During an informational session with University students, Hennessy confirmed the fact. As with other leasing decisions, the University chose Yusho based on an idea of what will benefit the community. Commercial diversity is important, a mix of upper- and lower-end retail, as well as of local, regional, and national brands, according to Hennessy. But student input doesn’t always bring success. The Prairie City Diner, a late night spot where students could hang out, opened on 57th Street in 1987, but closed abruptly in 1989. The diner’s landlord was the University of Chicago. Ilene Jo Reizner, who worked at the University from 1986 to 2009 and served as its assistant vice president of real estate operations, called Prairie City a cautionary tale. Within two years, Prairie City Diner was headed towards bankruptcy. “It wasn’t because of the rent. It was because people didn’t go,” Reizner said. An effort to balance student interests while also providing solid financial security may in part explain the University’s reasoning behind turning to larger chains like Chipotle or Clarke’s. Presumably a major chain with a central office would be able to avoid some of the financial mismanagement and risk that might have shuttered Prairie City—as well as Third World. Randall Hunt started his catering businesses, Cookies w/Flavor, ten years ago. Once a door-to-door enterprise, by last year the business had made enough for Hunt to start looking for an actual storefront. Hunt has been on the prowl. One of the locations that Hunt looked at was a space on 55th and Woodlawn. Sited on a major thoroughfare close to campus, it seemed to fit the bill. Hunt called the number of the realtor provided on the building. The two got to talking. “Are you crazy?” Hunt recalls thinking. To put this asking price in some context, the Hyde Park property Hunt later considered was a 3,800-square-foot space with a monthly rental rate of $5,000. The University was not the owner. CREO is open about its healthy supply of capital. On a tour of 53rd Street on Februrary 19, Hennessy discussed a number of areas where the University subsumes upfront financial risk to help a new business grow. The University, he explained, technically doesn’t have to pay taxes on the new 53rd Street Tower (slated for the lot where Mobil gas station is now located) since it is a non-profit institution. It is choosing, however, to pay taxes nonetheless. Tax dollars would go into the Tax Increment Financing (TIF) fund for the district, which he hopes will lead to even further growth. Similarly, it is known that Third World Café struggled from time to time, and the University showed some leniency. A Medill feature reported in 2009 that although Raymondo was having trouble making his rent, the University cut him some slack, allowing him to pay later if he needed to. And in 2003, the Chicago Tribune reported that the University attracted the Checkerboard Lounge, an historic but suffering Bronzeville blues club popular with U of C students, to relocate to Hyde Park with a below-market rental rate of $7 per-square-foot. The lounge’s owner claimed that was all he could afford. It’s uncertain whether CREO’s track-record of looking past a business’s finances—for whatever reason—actually amounts to an official practice. Moreover, if the way the University charges rent does vary between businesses, it is unclear who makes that call, and on what grounds. The University does not discuss the terms of its leases, according to Coleman. “Each lease is a negotiation based on the particular conditions of the space and the needs of both parties,” she said. However, during a tour of 53rd Street with students last week, Hennessy stated that the University does not and has never offered “subsidies” to any of its commercial renters. But, he clarified, the University does occasionally offer free or reduced rent for three to six months at a time. Community members say they don’t know what to make of it. Sapstein still doesn’t understand exactly what happened to his bid for the Third World space. From prior experience working closely with realtors, he felt good about his chances. Schrader was eager to keep things moving at the beginning, and Sapstein’s own financials hadn’t a blot. Sapstein could only speculate as to why the process stalled—perhaps someone didn’t want another café to replace the one that had just closed, or perhaps they were looking for a safer investment. Sapstein was unaware at the time that Merges’ Yusho, the chef’s second restaurant, would be opening in the Third World space. According to Hennessy and Coleman’s statements, Merges had been in talks with the University from the time before the closing of Third World through the period Sapstein was talking with Schrader. Before opening its doors, Yusho has already run into complications. Merges had planned for the restaurant to sell alcohol just as it does in its Logan Square location, but he was unaware that the space was in a dry precinct until after he had agreed to the University’s lease, the Hyde Park Herald reported last month.